The common grace of God is His acts of love to all men, whether those men be good or evil (Mat 5:43-45). This common grace includes giving mankind men who see more clearly than most what is true, good, and beautiful, even if they are not His children. Indeed, sometimes the children of this generation are more shrewd than the children of light (Lk 16:8). One such man, who lived 24 years beyond our allotted fourscore, was Jacques Barzun, who died yesterday. Barzun’s magnum opus, From Dawn to Decadence, was written when he was 92. For an encyclopaedic account of the collapse of Western culture, this may want to be your first choice. His account of the dissolution of Western society (especially when read alongside Alister McGrath’s Christianity’s Dangerous Idea), will give any Christian leader a strong sense of the history and consequences of ideas. It was several years ago that I picked up The Culture We Deserve, and found myself underlining paragraphs, and asterisking whole sections. Barzun is like an updated Matthew Arnold: seeing the importance and virtue of high culture for preserving a consensus of the good and the beautiful. Barzun was not afraid to call it as he saw it: the West has been disintegrating, not progressing, in its cultural life. The Use and Abuse of Art, I’ve been told, is another gem. His book on writing, Simple and Direct, made me feel as if I had done nothing but write in clichés my whole life. I still think this book is superior to Zinsser’s On Writing Well and, in some respects, Weaver’s Rhetoric and Composition. Barzun, though he made no profession of faith in Christ, taught me more about thinking clearly, writing well, and loving the good, than many of those I found within the household of God. And I, for one, am thankful to God for His common grace in giving our generation such men. “Everywhere, everywhere, Christmas tonight!”—Phillips Brooks. That there were in the world multiplied millions who had never heard of Christmas did not matter to our poet for the purpose of his poem. He was expressing an emotional fact, not a statistical one. Throughout the Western world we tend to follow the poet and approach Christmas emotionally instead of factually. It is the romance of Christmas that gives it its extraordinary appeal to that relatively small number of persons of the earth’s population who regularly celebrate it. So completely are we carried away by the excitement of this midwinter festival that we are apt to forget that its romantic appeal is the least significant thing about it. The theology of Christmas too easily gets lost under the gay wrappings, yet apart from its theological meaning it really has none at all. A half dozen doctrinally sound carols serve to keep alive the great deep truth of the Incarnation, but aside from these, popular Christmas music is void of any real lasting truth. The English mouse that was not even stirring, the German Tannenbaum so fair and lovely and the American red-nosed reindeer that has nothing to recommend it have pretty well taken over in Christmas poetry and song. These along with merry old St. Nicholas have about displaced Christian theology. It does seem strange that so many persons become excited about Christmas and so few stop to inquire into its meaning; but I suppose this odd phenomenon is quite in harmony with our unfortunate human habit of magnifying trivialities and ignoring matters of greatest import. The same man who will check his tires and consult his road map with utmost care before starting on a journey may travel for a lifetime on the way that knows no return and never once pause to ask whether or not he is headed in the right direction. The Christmas message, when stripped of its pagan overtones, is relatively simple: God is come to earth in the form of man. Around this one dogma the whole question of meaning revolves. God did come or He did not; He is come or He is not, and the vast accumulation of sentimental notions and romantic practices that go to make up our modern Christmas cannot give evidence on one side or the other. Certain religious teachers in apostolic times refused to believe that Jesus was actually God come in the flesh. They were willing to exhaust the language of unctuous flattery to describe His glorious manhood, but they would have none of His deity. Their basic philosophy forbade them to believe that there could ever be a union of God and human flesh. Matter, they said, is essentially evil. God who is impeccably holy could never allow Himself contact with evil. Human flesh is matter, therefore God is not come in the flesh. Certainly it would not be difficult to refute this negative teaching. One would only need to demonstrate the error of the major premise, the essential sinfulness of matter, and the whole thing would collapse. But that would be to match reason against reason and take the mystery of godliness out of the realm of faith and make of it merely another religious philosophy. Then we would have rationalism with a thin Christian veneer. How long before the veneer wore off and we had only rationalism? While faith contains an element of reason, it is essentially moral rather than intellectual. In the New Testament unbelief is a sin, and this could not be so if belief were no more than a verdict based upon evidence. There is nothing unreasonable about the Christian message, but its appeal is not primarily to reason. At a specific time in a certain place God became flesh, but the transcendence of Christ over the human conscience is not historic; it is intimate, direct and personal. Christ’s coming to Bethlehem’s manger was in harmony with the primary fact of His secret presence in the world in preincarnate times as the Light that lighteth every man. The sum of the New Testament teaching about this is that Christ’s claims are self-validating and will be rejected only by those who love evil. Whenever Christ is preached in the power of the Spirit, a judgment seat is erected and each hearer stands to be judged by his response to the message. His moral responsibility is not to a lesson in religious history but to the divine Person who now confronts him. “Everywhere, everywhere, Christmas tonight.” But Christmas either means more than is popularly supposed or it means nothing. We had better decide. Conservative Christianity is concerned with conserving all it means to be Christian. Broadly speaking, all Christians want to see Christianity conserved; our disagreement consists in what we think must be conserved to achieve that. Generally, evangelicals and fundamentalists think that the preservation of Christianity consists in the conservation of the gospel itself, along with a strong commitment to biblical doctrine. If I read them right, methods which preserve and propagate the gospel and sound teaching are the means to conserve Christianity. Therefore, a large amount of hope is being placed in expository preaching, church membership, church discipline, biblical discipleship, spiritual leadership, theological literacy, clear evangelism and robust missions. Certainly, the revival of emphasis on these aspects of Christianity is to be applauded and welcomed. While I agree with the commitment to the gospel and biblical doctrine, I don’t think these alone are enough to conserve and propagate biblical Christianity. I think several other things are essential to Christianity and need to be conserved. I believe Christianity is a life of love; therefore, Christians have to be very concerned with the matter of the affections: what we are to love, to what degree, and in what way. We further have to be concerned with what shapes those loves, what affects and moulds our imaginations. To navigate these issues, we have to be concerned with meaning, discovering what various objects, things, gestures, practices or other cultural artifacts mean, since we end up using them in life or worship. Therefore, I urge the study and understanding of such things, not because I want some complex form of Christianity, but because I think these things are essential to Christianity. I think that Christianity lacking these distinctives is, in fact, a truncated Christianity. That is, instead of being a sleek, supple, essentials-only Christianity, I see it as ultimately incapable of sustaining the life of faith. I think that the removal of a right understanding of the affections, a neglect of what shapes the imagination, an incorrect understanding of how we know, and a failure to relate the centrality of the affections to the doctrine of sanctification will result in a severely under-developed spiritual life. The resulting Christianity walks into the gale-force winds of modern unbelief with something barely more than a mental and volitional commitment to certain biblical facts. In the face of such a storm, quite literally the majority of those who have grown up with such a minimalist Christianity are blown off into apostasy or a secularized form of religion. A small minority of people barely hang on to their creed by the tips of their fingernails. Sadly, this massive fall-off is considered normal, and is proof-texted with the parable of the soils. In other words, my commitment to conservative Christianity is not due to cultural imperialism, or an obsession with particular applications of the Bible to behavioral standards. I embrace conservative Christianity because I think it is a full-orbed Christianity, and the only kind that will ultimately survive. I think that it is the kind of Christianity that had always existed in various shapes and forms before its secularization in the 19th century. So here is the irony and the misunderstanding. As I look at Christianity, I think that the conservative take on it is not baroque and ornate; it is simply what is required to sustain healthy Christianity. I look at those who disagree with me and I see a reduced, skeletal Christianity that can barely keep its own head above water, let alone seriously defend or propagate the faith in the challenging years ahead. I see the current state of evangelicalism and fundamentalism as emaciated and spiritually anaemic, scarcely holding on to life. Worse, it regards its weak pulse and laboured breathing as evidence of its healthy commitment to ‘core essentials’, and thanks God that it is not as other men are: legalists, cultural snobs, elitists, or even as this tax collector. On the other hand, those I’m looking at see my take on Christianity as a massive confusion of non-essentials with essentials, of turning applications into doctrines, and of seeing inferences and non-biblical knowledge as authoritative. I’m the guy wearing four woolen jerseys on a summer’s day, unnecessarily laden-down with joy-killing extras. As far as they are concerned, they have streamlined, flexible, gospel-centred Christianity, free from cultural imperialism and fundamentalist taboos, brimming with nothing but Scripture and Scripture alone. Conversely, I think this Christianity is not supple, slick and Scripture-centred; I think it is abbreviated, inconsistent and intentionally agnostic where it needn’t be. I know God can do anything, and that God’s ultimate purposes will prevail. I know that God continues to use all kinds of means and imperfect men and methods. However, a steward does not have the right to be careless and sloppy because his Master is sovereign. I urge the ideas of conservative Christianity because I love Christ and His church, and want to see Him honoured and His church conserved and propagated. In the Dark Age we’re in, we can’t afford to defend anything but the essentials. I’m convinced that’s what I and others who share these convictions are doing. Christians often imbibe facile and unhelpful definitions of legalism. One of these is the idea that legalism is the act of judging the meaning cultural phenomena, or to put it another way, the act of judging the meaning of things in our world. Christians live in the world, and therefore Christianity is to be lived out in the world. Christians live in a world that is full of meaning, because it was created by an intelligent Creator who invested it with His intended meanings, and because it has been fashioned and shaped by intelligent creatures who have fleshed out their understanding of its meaning. Meaning is everywhere. Wedding ceremonies have meaning. Eating at a dinner table instead of eating a TV dinner in front of the box has meaning. Meaning exists in churches with high arches, as it does in churches with flat ceilings lit with fluorescent-lights. The colors worn to funerals have meaning. The music played at Arlington National Cemetery has meaning. A mini-skirt has meaning, as do ties, earrings, sunglasses, tatoos, and lip-stick. Having a cell-phone has meaning, as do the paintings on your wall. Your choice of words has meaning, as does sculpture and painting. Economics has meaning, as does your choice of car. Everywhere they turn, human beings give the raw materials of creation meaning, or discover that they already possess meaning. We are intelligent beings created in the image of an intelligent God, and it is in our nature to shape or interpret the meaning of our environment, whether or not we are always conscious of those meanings. Sometimes these meanings exist purely because they have come through use. In South Africa, there is a mini-language used by commuters who catch mini-bus taxis. It consists of holding up a certain number of fingers held in a certain direction that indicates your desired destination. Taxi-drivers and taxi-riders know the meaning of this ‘language’, a system of meaning that arose purely through use. Sometimes these meanings exist through association. The ‘rainbow-flag’ is now associated with homosexuality. The living-dead look is associated with Gothic music. Whether the meaning created the association, or whether the association created the meaning is debated. What is clear is the practical result: the shoe fits, and the current meaning-by-association exists. Sometimes these meanings exist because there is something intrinsic in the thing which dictates what it can or cannot (or ought not) signify. Darkness comes with some meanings inherently opposite to those of light. Loud sounds inherently communicate differently to soft sounds. Whether people correctly perceive these meanings does not make them non-existent. If I am in an elevator and three Bulgarian men are mocking my clothing in Bulgarian, my blissful non-comprehension does not mean their conversation lacked meaning. Perception of meaning does not affect its existence. It is post-modernity to suggest that meaning is in the mind of the interpreter alone. In a world full of meaning, it is up to the church to understand the meanings of things around them. Scriptural principles must be applied to life in the world. The only way this can be done is if the truth of life in the world is connected to the truth of Scripture. In other words, we need to know both the meaning of Scripture, and the meaning of the world. If we know only the meaning of Scripture, we lock it within its own covers. If we know only the meaning of the world, we may know the problems well, but we’ll lack solutions. We must know both Scripture and the world around us. Is a mini-skirt a violation of 1 Timothy 2:9? Does Proverbs 18:24 affect the use of Facebook? Does James 1:19 speak to blogging? Does a church that builds an ugly building disobey Philippians 1:9-10? Do Christians who use shoddy music in worship fail to practice Philippians 4:8? Does Romans 12:2 speak to how we use the mall? Does wearing beach-ware to church violate Hebrews 12:28? These questions can only be answered if we examine the meanings of mini-skirts, Facebook, blogging, architecture, music, the mall, beach-ware, and so forth. It has become a kind of reflex action to accuse Christians who examine the meaning of modern cultural phenomena of legalism. This is particularly true of matters like music, entertainment, technology, ministry methods, dress and the like. However, Christians and particularly Christian pastors who cannot discern the meaning and implications of the environment in which they live will fail to bring Scripture to life, in both senses of the term. Pastors must lead the way in scrutinising life. The excuse that “we didn’t know it meant that” will not exonerate us at the Bema seat. It is easy to lampoon the fundamentalist pastors who forbade wire-rimmed glasses, beards, and bell-bottoms in their time. One forgets that, in some cases, such men were trying to deal with the meanings of those things at that time, in that culture. When meaning is purely associative or conventional, it may change with time, meaning it is no longer hostile to the Christian message at a later time. This makes men of earlier times seem alarmist, just as faithful pastors who warn their congregants against current threats to healthy Christianity may seem so to future generations. In an increasingly complex world, Christian living (and shepherding Christians to live like Christians) is an increasingly complex task. The amount of devices, technologies, media, and social sub-cultures seems to grow exponentially every few years. These are not without meaning. Conservative Christians argue that timeless Scripture has something to say to them; therefore, conservative Christians regard it is an obligation to learn what these things mean. If we love Scripture and love obedience, we should love to learn how to apply Scripture in our world. Regardless of whether meaning is conventional, associative or intrinsic, it is there. For Scripture to be faithfully applied, we need to know the meaning of Scripture, and the meaning of the world around us. This is not legalism; this is wisdom. Believers obey God’s commandments (I John 2:3). With new hearts, we desire to please God and love Him in all things. To put it another way, we want to do His will as it is done in heaven. However, to do His will in all of life requires that we make judgements all the time. We have to judge things to be right or wrong, wise or unwise, better or worse in the practical details of life, not merely when speculating about abstractions. We’re continually making judgements. We also believe that the Bible must form the basis of our judgements. In considering the variety of situation we face in light of Scriptural revelation, we find three areas where He speaks with more or less specificity, which form the basis of all our moral judgements. The first area is matters of explicit command or prohibition. God simply mandates certain behaviours and forbids others. God tells us not to lie, steal or covet. He tells us to love Him and our neighbour, to pray continually, and to live sober and watchful lives. When God gives us these unambiguous ‘do this’ and ‘don’t do this’ statements, there is no discernment required. We must simply obey. The only difficulty here is knowing if certain commands still apply. For example, there is a command to keep Sabbath, but not all Christian agree on the timelessness of that command. A right hermeneutic will help us to see whether certain commands are timeless precepts for all God’s people of all times. The second area is matters revealed by principles. Principles give truths, usually in timeless, axiomatic, or generalised form, which must then be properly connected to the specific circumstances that a believer is in. “Vengeance is mine” is the principle that it is God’s prerogative to punish evildoers and repay evil. However, that principle must be applied and correctly interpreted in varying situations, such as the rights of human government, the prosecution of criminals, the implementation of church discipline, the forgiveness of offences, and how to respond to my neighbour’s loud music. The third area where we must discern God’s will is on matters that God neither requires nor forbids explicitly in His Word. Theologians have called these things adiaphora, from the Greek which means ‘indifferent things’. These refer to matters where Scripture has not told us one way or another. Here careful judgement is needed. The meaning of the thing or activity in question must be properly understood, and then linked back to Scriptural commands or principles. One characteristic of modern libertarian Christianity is its tendency to adopt an inverted legalism. In order to justify its ‘freedoms’, it makes an appeal to the letter of the law. That is, it shaves down the actual obligations of a Christian to explicit positive or negative biblical commands. It wrangles free of the implications of many biblical principles, claiming exemption from them with the post-modern’s motto: “that’s just your interpretation.” Finally, when it comes to adiaphora, it looks incredulously at the one seeking to form a judgement on any such matter. After all, if God hasn’t said anything about it, then the matter is meaningless, morally neutral, and without any serious moral implications. By a weird abuse of sola Scriptura, the only admissible judgements are the first category of explicit commands and prohibitions. The rest of life, it seems, does not matter to God. Finally, with rich irony, these legalists brand anyone who offers a moral judgement on any of the adiaphora with the term – you guessed it – legalist. Biblical Christianity has always recognised the need to extend the principles of Scripture to all of life. This is wisdom. Biblical Christianity has also recognised the need to be careful and humble in our judgements on matters where Scripture does not speak. However, Scripture’s silence does not always indicate God’s indifference. God has not spoken on every area of human life, because His revealed Word, when used by people who are seeking wisdom, ought to lead to correct moral judgements. Abortion is wrong, not because it is explicitly forbidden, but because a logical application of Scripture, combined with a right medical view of life beginning at conception, leads us to see it so. For us to have a full-orbed Christianity that glorifies God in the details (1 Cor 10:31), we must throw off this pseudo-sola Scriptura, and learn again how to principlise, and judge adiaphora correctly. 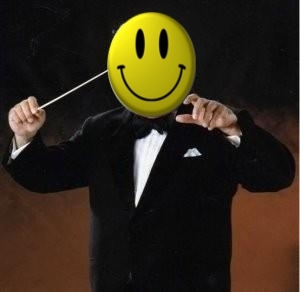 On one particular evening, the man invited some of his friends, who were still worshippers of Lord Smiley-Face, to hear an orchestra. His friends chatted happily before the performance began, and it seemed as if their accents had been affected by something, for they suddenly sounded slightly polished and nasal. Thankfully, they returned to normal after the concert. The concert was masterfully executed by the musicians. The piece of music told its story, weaving through twists and turns, adding variation upon variation on the central theme. The composer never surrendered to the desire to create effects for their own sake, nor to be bombastic, obnoxious or sentimental. He did not tickle those who wanted their emotions tugged, nor did he reward lazy ears. He did not manipulate the hearer, but artfully drew him into the story, unfolding it layer by layer, building it layer by layer. When it was over, the man invited his friends over to his home. He was desirous to hear their impressions. They were smiling, as holy worshippers of Smiley-Face did. “It was very impressive,” said one, sipping his coffee. “I especially loved the part when the trumpets went pum-pa-pum-pum-pum,” said another, poorly mimicking the part in question. “There really is depth to this music,” said a third, looking self-consciously serious, munching on a ginger cookie. The others nodded, with solemn hums. The man masked his disappointment with these responses and ventured what was on his heart. “Of course, beautiful, beautiful,” they clucked, as if they had been asked if the sky were up or if the earth were round. The man swallowed, and pushed on, half-sensing that the pleasantries of the evening were about to end. “Yes, exactly – enjoyable!” said one of the friends, his face displaying visible relief. “Well… sure.” They began to look suspiciously at the man, wondering where this was going. “This kind of music isn’t everyone’s cup of tea, you know!” said the loudest one of the group. The man waited a moment and pressed on. “Not beautiful for them, you mean,” said one friend, happy to know he had spotted the error in the man’s thinking. “Beauty is a matter of personal taste,” he said, looking momentarily philosophic. The momentary silence betrayed the fact that his friends were in uncharted intellectual territory. And then they broke into a simultaneous chorus of “I wouldn’t put it that way” and “not exactly” and “that’s not what we’re saying”. Finally one spoke for them all. “The music is beautiful. But not everyone appreciates this kind of thing. We’re all different.” He didn’t seem to realise that he hadn’t answered the man, or said anything different. The man knew his friends were running out of patience, but he hoped for a breakthrough. He prayed inwardly, and began speaking quietly, and directly. His friends seemed to be listening, their eyes occasionally darting to each other and back to the man. The last statement set the cat amongst the pigeons. Violent head-shaking and verbal negations followed. They seemed to be climbing over each other’s sentences to respond. One emerged on top of the others. “Are you trying to say that the people who didn’t like tonight’s performance are evil?” he demanded, his voice rising to a near-shriek on the last word. The man waited to answer, and deliberately lowered his voice. “So, you’re saying it would be a sin to dislike the music we heard tonight?” asked one, sounding like a journalist. “And how do you know if God loved the music tonight?”, asked one in a tone that suggested she wanted to poke a bony finger into his chest. The man scanned the faces of his friends, and then dropped his gaze, looking at his shoes with sadness.